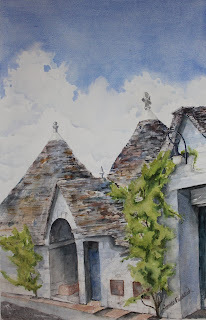 Janice H2O Color: "A" is for "Alberobello"
Once again I'm taking a painting class at Mission College. This semester the instructor, Mark Engel, came up with a new scheme for the class: we are to create 26 paintings-one for each letter of the alphabet. For my first, I used a reference photo I took when we were in Italy 2 1/2 years ago. We visited the town of Alberobello in the region of Puglia. It's a UNESCO World Heritage site, due to the hundreds of trulli-little dome-shaped stone and stucco houses with stacked stone roofs. We even stayed in a trullo for 2 nights! The living room was large with a wonderful soaring ceiling of exposed stone but the bedrooms and bathrooms were teensy and oddly shaped. There's even a church in the town made up of several trulli. Wow, those clouds are awesome! and the texture you got going in the roof and tree. Really great work Janice!